When your washing machine smells, it means it needs to be cleaned using a top rated washing machine cleaner. Cleaning your washing machine will remove soap scum, mineral deposits, bacteria, mold, mildew, and any other types of things that makes your washer smell. After doing hundreds of loads of clothes in your top or front load washer, there may be a buildup of grime and gunk inside the tub or door gaskets of your washer. 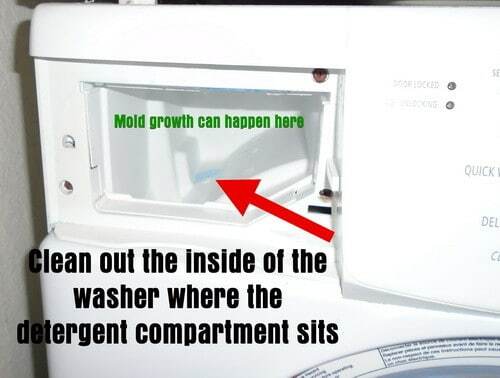 Special types of washing machine cleaners have been formulated to wash away this gunk and mold to remove it for good. If you have a front loader, there are additional things you can to clean the washer besides just using a special cleaner. You should use a multipurpose cleaner and spray down the rubber door seal. Since there are areas of the rubber door seal that the cleaner cannot get to, this must be done manually. So spray the rubber seal with a non corrosive multipurpose cleaner and be sure to gently pull back on the rubber seal. When you pull back the rubber seal, you will notice a discoloration which means there is mold or dirt trapped in between the seal. Make sure you vigorously clean all this dirt out wiping down the complete seal 360 degrees. Clean mold from front load rubber door seal! Next, check to see if your front load washer has a catch pump filter. It should be located on the front bottom of the washer. This pump filter catches any debris that runs through your washer. 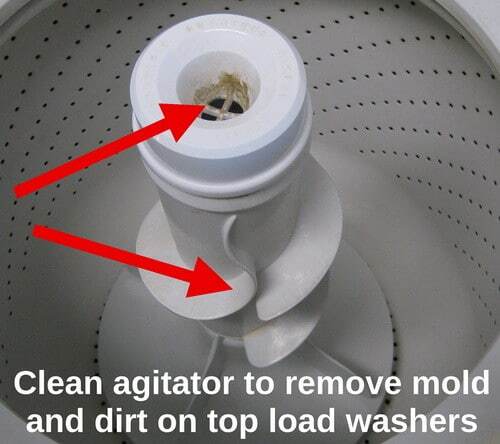 If you have not taken the filter out and cleaned it, then this could be part of your smelly washing machine problem. Here is a video on how to remove the filter on your front load washer. Another part of a front load washer that can get mold growth and cause a bad smell is the washing machine bleach, softener and detergent compartment. This slide out compartment is removable and easy to clean. To remove it, pull it all the way out and look for a little clip at the back. Press down on this clip while you are pulling the detergent compartment and it will fully slide out. Next, soak the complete detergent compartment in the sink with hot water. Scrub the parts down and make sure none of the nozzles are clogged. While you are letting it soak in the sink, look in the washer where the detergent compartment was. You will most likely see spilled detergent or possibly mold growth inside. Use your multipurpose cleaner and wipe this area out also. This will eliminate the possibility of the bad smell coming from either the detergent compartment or where it sits in the washer. So once you have the rubber seal, detergent compartment, and where the compartment sits completely sparkling clean, then it is time to use your washing machine cleaner. Since a top load washer differs greatly from a front load washer, there are not many areas you can clean before using the washing machine cleaner. The few places are, the agitator, bottom of the lid, and upper tub lip. You can use a multipurpose cleaner and scrub down the agitator if you see or find any mold or dirt on it. 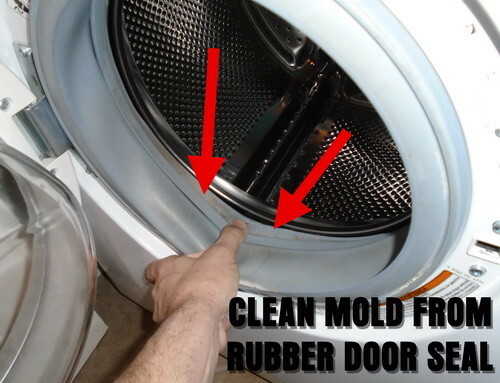 Next you can clean the bottom of the washer lid as water cannot reach here but mold can. Also you can scrub down the inside top lip of the washer drum. 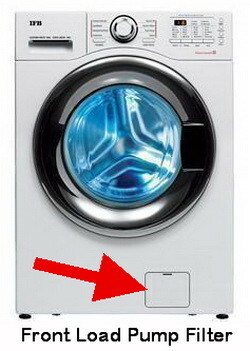 There may be gunk or mold here as the water may sometimes not be able to reach when using the washing machine cleaner. Once you have everything cleaned manually on your top load washer, then it is time to use the special washing machine cleaner. What Is The Top Rated Or Best Washing Machine Cleaner? According to Amazon ratings and customer reviews, the best washing machine cleaner is Glisten Washer Magic Washing Machine Cleaner. This cleaner is in liquid form and is perfect for HE washers, Front load washers, and Top load washers. You should always clean front-loading washing machines every so often. 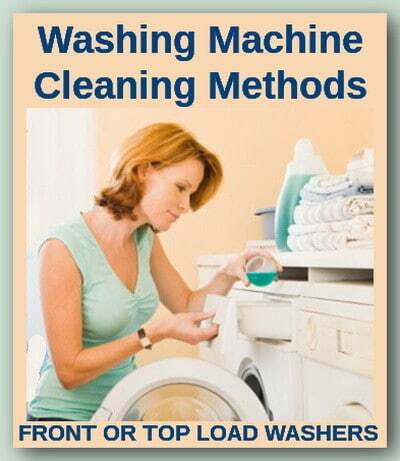 Clean front-loading washing machines with help from a home cleaning professional. bacteria, soap scum and mineral deposits from your top-loading washing machine. 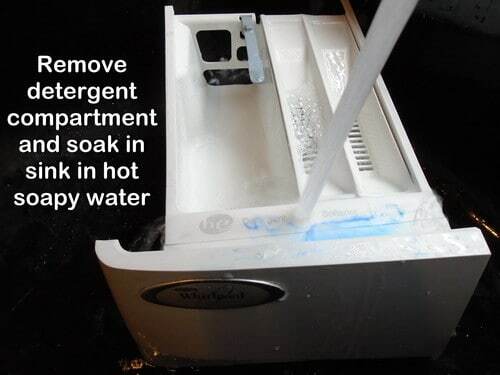 How you can easily cure a washing machine from smelling. Tide Washing Machine Cleaner. It helps fight and lift odor-causing residues as it freshens for a clean, fresh washer. 1. Fights odor-causing residues with a powerful oxygenated bleach system that gets at the source of the odor. 2. Penetrates & lifts away residues and deposits from the surfaces in your washer with specially designed surface active ingredients. 3. Freshens your washer, while leaving behind a crisp, clean scent. If you know of a better way to clean a washing machine whether it be a front load or a top load, please leave a few suggestions in the comments below to help others.